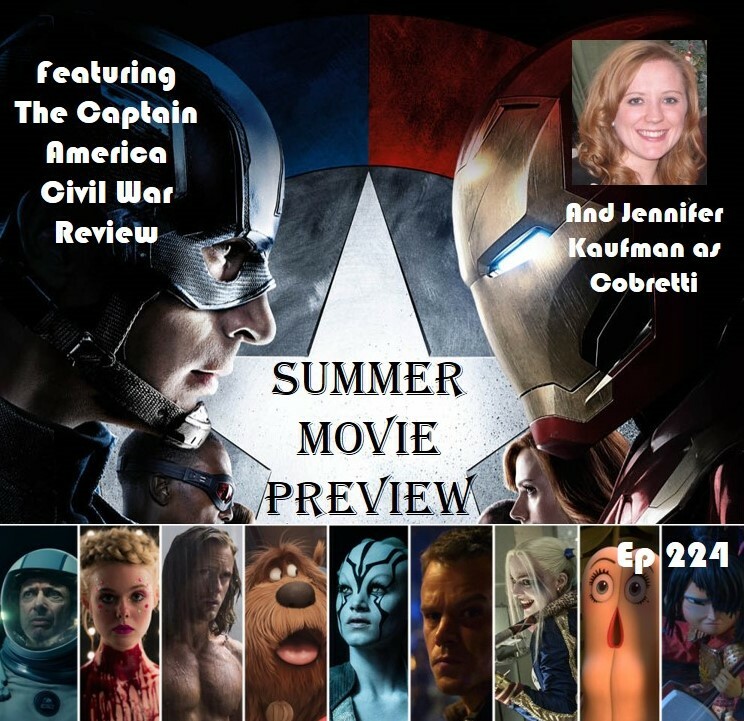 The Deucecast Movie Show: Episode 224: Summer Movie Preview, ft Capt America & J-Kaufman as "Cobretti"
Episode 224: Summer Movie Preview, ft Capt America & J-Kaufman as "Cobretti"
It's the summer movie season and The Deucecast Movie Show is here to give you the lowdown on a few dozen flicks that you should see (Suicide Squad) and miss (War Craft) and everything in between. In the studio, joining Mikey, Pinky & Dave is friend of the show, movie historian and Terrence Malick apologist Dr. Earl, and welcoming on the Binder & Binder Law Firm Hotline is Delightful Life website podcast host, writer, mother and blogger Jennifer Kaufman. First, the birthday movies where you can find out how old Shrek is, as well as Barb Wired (!) and then a brand new game called "Horse or Communist"... what is a movie from foreign land, and what is the name of a Kentucky Derby contending horse? Find out here. And then, the Summer Movies take over... thoughts, opinions and previews on the upcoming Ghostbusters reboot with the great Chris Hemsworth role... lamenting the absence of Rick Moranis... the completion of the latest X-Men trilogy... the ballroom blitz of Suicide Squad... why d$ loves the not-Star Trekky new Star Trek... a Scott Bakula name dropping!... Finding Dory... Pinky's stretching of the rules... and of course, more Superman III talk. Why? Ask Pinky... Zac Efron returns... more Angry Birds... the deep of The Shallows... Neon Demon making everyone yell "Elle Yes"... and two of the hosts find their movie in Mike & Dave Need Wedding Dates... the 73rd installment of Ice Age... and yes, talking food in an adult cartoon called Sausage Party. Friend of the Show Jeremy Burgess also submits his movies he wants to see, including independent fair like The Lobster and Swiss Army Man. America's Favorite Movie Segment returns with Pinky discussing Over the Top in a Pretty in Pink session. And here Pinky say the words "I have a movie fetish! I like..."
...then gives you plenty of chances to turn the channel as the group goes SPOILER ALERT CRAZY with a spoiler filled discussion on the film.